The American Eagle Platinum Proof coins made their debut in 1997 and have appeared annually since. A unique attribute of the platinum coins is that the reverse design changes yearly, as opposed to the gold and silver coin designs which can remain the same. The US Mint produced four different sized platinum coins including 1 ounce, 1/2 ounce, 1/4 ounce and 1/10 ounce each year as part of the Eagle series. They also combined the four different sizes in a set that was available in 2006, 2007 and 2008. However, near the end of 2008, the Mint announced that it would no longer create the fractional sizes of platinum Eagles or the box set, making the one ounce size the only one available. Most of 2009 saw no production of platinum Eagles by the Mint. In fact, gold and silver Eagles were similarly missing from the Mint's offerings. This changed on December 3, 2009, however, as the Mint released the One Ounce Platinum Eagle for purchase by collectors. Demand for the coins was strong and within a week, the Mint had declared a sell-out. Even with a price tag of $1,792 and a household limit of 5, eager collectors hastily bought the mintage limit of 8,000. Update: This coin was followed the next year with the 2010 Proof Platinum Eagle Coin. An image of the the Statue of Liberty looking "towards the future" is featured on the obverse of the Platinum Eagle. It was designed by John Mercanti and also includes the inscriptions "Liberty," "E Pluribus Unum" and the year of mintage. 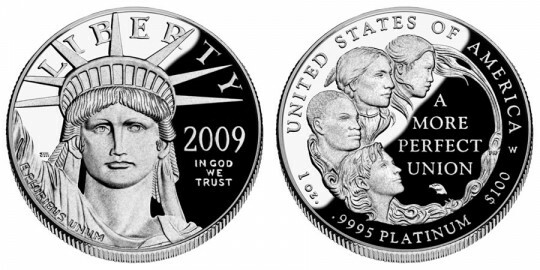 The reverse design for the 2009 Platinum Eagle Proof is the first of a series of six dedicated to the principles of the Preamble of the Constitution of the United States. The 2009 theme is 'a more perfect union' and uses four faces to represent the diversity of the population with their hair and clothing winding together. To the right of the faces is the inscriptions "A More Perfect Union." Also seen are "United States of America" and ".9995 Platinum" as well as the size and the face value of the coin. The reverse was designed by Susan Gamble and sculpted by Phebe Hemphill.